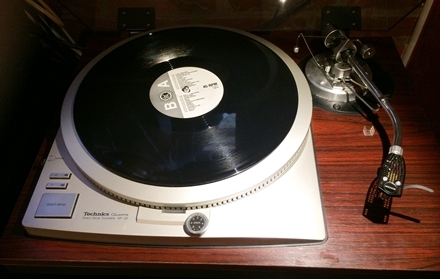 The Technics SP 25 Mk2 was manufactured in 1979 to 1988 by the Japanese company Matsushita (Panasonic). It’s based on the SL1200 motor unit but compete more with the SP-10MK II professional units. The SP-25 was typcial sold to radio stations. The plinth and the tonearm had to be ordered separately. This unit got the rosewood veneer (SH-15B2) but uses and SME-3009 II tonearm. This combo makes it in my mind an awesome machine, certainly if as it this case armed with an Ortofon MC cartidge.